Jason, Michael, and Tahani are waiting on the train. 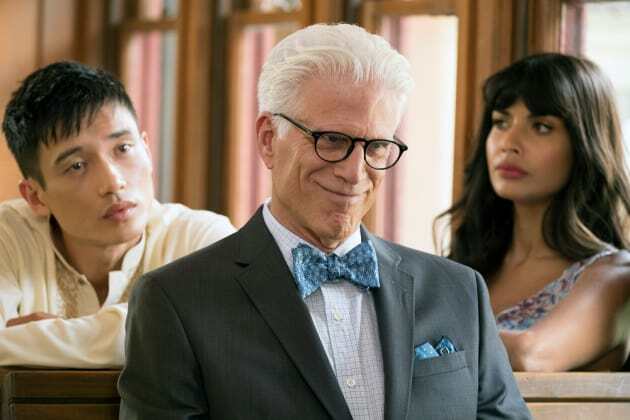 The Good Place Season 2 Episode 10: "Best Self"
Critics Choice Awards Winners: Who Took Home the Gold? Michael: All I really ever wanted was to know what it feels like to be human, and now we’re going to do the most human thing of all: attempt something futile with a ton of unearned confidence and fail spectacularly! Permalink: attempt something futile with a ton of unearned confidence and fail spectacularly! 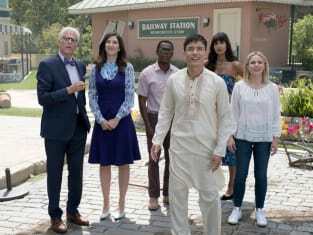 I propose that everyone who’s green go ahead and board the magic balloon and set out to the Good Place, sort of like an advance team—we’ll put our names in, or book a table, however it works. And then we’ll send back the magic balloon for the red light people later on. It’s a perfect plan.